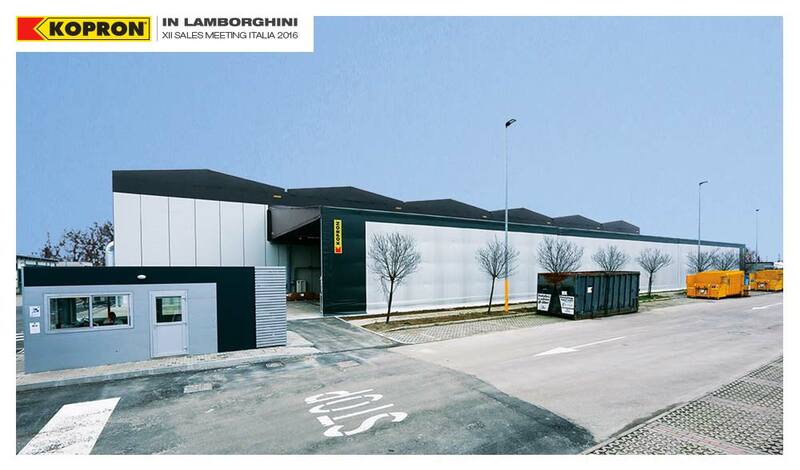 12,000 m2 of indoor space for the new Automobili Lamborghini temporary warehouse: the expertise of Kopron to the service of the “Casa del Toro”. 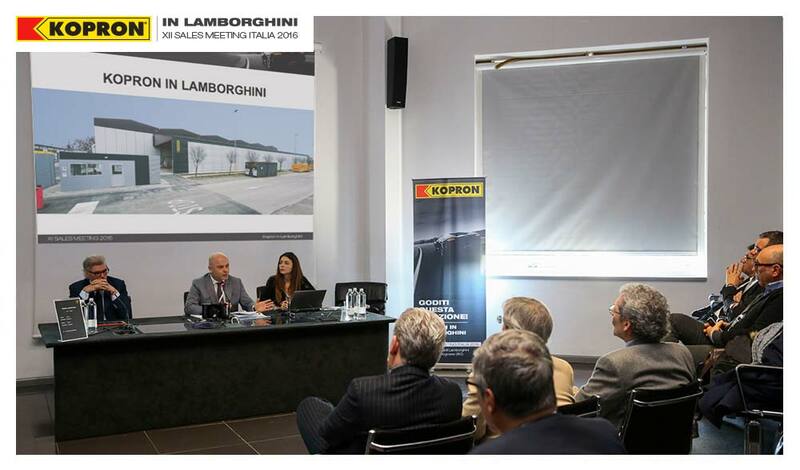 Top management of Kopron and the entire Italian salesforce have come together for the XII Sales Meeting in the historical museum of Automobili Lamborghini, for presentation of the innovations and functionalities of the new warehouse, the greatest achievement of Kopron 2015/16. Ferruccio Lamborghini stated with pride: “The history of Lamborghini is easy to tell…. Others were less important”. This sentence summarises the history of an automobile company that increased the excellence of Made inItaly to the highest possible levels throughout the world. 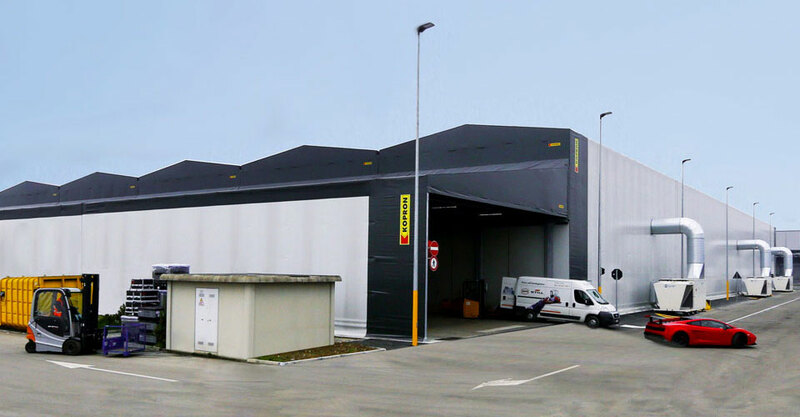 Kopron has collaborated with this important company in order to optimise logistics further with the help of a new temporary warehouse of12,000 square metres. 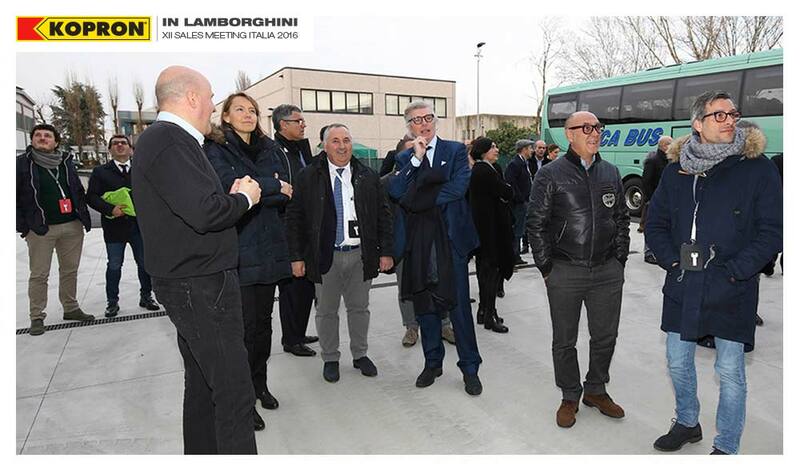 The installation was completed in just 45 days and successfully implemented in the production plant and headquarters of Automobili Lamborghini in Sant’Agata Bolognese (BO). “We chose Kopron for the modularity of its tents, allowing us to dismantle the warehouse and use it again in other locations and for different types of activities, once the cycle for the current function has been completed, states Engineer Ranieri Niccoli, Industrial Manager of Automobili Lamborghini, and he goes on to say: “while awaiting construction of a warehouse made from brickwork we decided to take advantage of the potentials of the steel and PVC constructions in order to guarantee continuity and rapidity to the production process”. Rapid construction, structural flexibility and seismic resistance are the main advantages that the Kopron tents offered Lamborghini and all of its personnel. Thanks to its modularity, in the future this warehouse can be reused in other contexts, also with a different layout, and therefore the Kopron tents become an asset for all companies who choose to expand with flexibility. 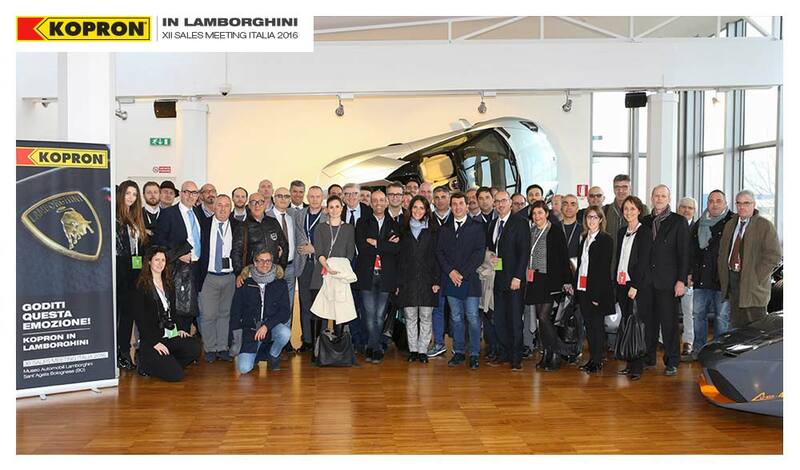 “Our collaboration with Automobili Lamborghini has resulted in full achievement of their objective, which was to create a high quality structure in line with their image, in a short amount of time and with excellent functional results” states Mario Vergani Kopron CEO. In particular Kopron created six independent tents: two with single inclination, five with quick folding doors. The warehouse, in general, is considered as a single structure with a height of10.5 metresand approximately100 metresin length. Everything is fitted with two external tents, approximately15 metreswide and 57 and72 metreslong, also fitted with prefabricated modular structures for bathroom and office/waiting room areas, all completely furnished. The new temporary Kopron structure, manufactured entirely by an Italian production chain, has its structure made from hot galvanised steel tubes and covered with a class 2 fire resistant PVC curtain. “Development of the warehouse involved an in-depth study in terms of spaces and the location made available by the customer. We managed to satisfy his requirements by carrying out project management, allowing us to enhance and optimise large areas quickly and efficiently” states Architect Giovanna Comi, the Kopron Design Department Manager. The five quick folding doors “Fast Pack” and the pedestrian doors that coordinate incoming/outgoing flows from the warehouse have been manufactured in the Technological Centre dedicated to closure systems, KopronPuglia. The Fast Pack doors guarantee quick transit and minimum obstruction with a high level of resistance to wind and a protection system against dust.